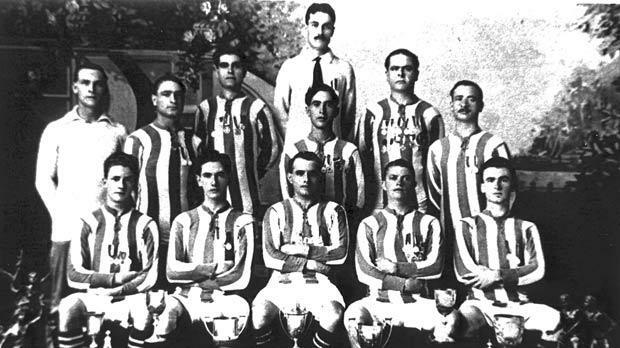 Floriana FC, 1920-21 league champions. The football craze that swept through Europe at the end of the First World War spread around the continent fast and the rise in popularity for the game also gripped our country. Season 1920-21 brought a lot of enthusiasm but it would, of course, have been naive, knowing the boisterous character of the Maltese, to expect the competition to go by without its fair share of controversy. The championship that year was contested by a record 11 teams which caused a lot of problems for the administrators. Floriana and St George’s made a welcome return to competitive football after a lapse of some seasons. They joined up with the five teams which had taken part in the league the previous year together with Sliema Rangers, Qormi United, Msida Rangers and the Dockyard Police. Msida Rangers already had some experience of league football, having taken part in the championship between 1912 and 1915. Sliema Rangers and Qormi United had played in the previous season’s Cousis Shield. The Dockyard Police were the ‘dark horses’ of the competition having been founded just before the start of the season. Because of their inexperience, the police were not taken too seriously by the other teams. On the whole, however, they did not fare too badly. Although finishing at the foot of the table, they were never outplayed except, perhaps, against Floriana when they were hammered 8-0. Their best game was against Sliema Rangers whom they beat 3-1. The championship began in November 1920 when Floriana trounced Paola United 7-0 but the next day the picture was quite different. A large crowd saw Valletta United edge St George’s 2-1. The following weekend Ħamrun Spartans met very little opposition from Sliema Rangers before they won 4-1, but, a day later, Floriana were stretched to the limit before they could beat Marsa United by the narrowest of margins. Around 4,000 spectators turned up at the Mile End the following Sunday to watch reigning champions Sliema Wanderers do battle with St George’s. The Blues, however, were surprised by the men from Cospicua when Manwel Busuttil rose above friend and foe to head in what proved to be the only goal of the match. The day before the match between Sliema and St George’s, Valletta United were due to play Paola United. The game was postponed because of bad weather but it was never played because Paola United did not honour the fixture. It was the first of nine walkovers that season. It was clear from the start that some of the teams were not of the same calibre of the others and as the season progressed, some high scores were also registered. The highest was the 13-0 drubbing of Qormi United by Marsa United. These high scores led to a loss of interest in the competition by the weaker teams and they preferred to stay at home rather than being slaughtered by their more skilful opponents. This was not the only trouble the MFA had to face that season. Two serious incidents took place in the matches Sliema Wanderers vs Ħamrun Spartans and Floriana vs St George’s which led to Sliema and St George’s being suspended for the rest of the season. On January 25, 1921, Floriana were due to meet rivals St George’s in a match which had a great say on the final destination of the championship. Floriana had the best of the early play. However, with the final seconds of the first half ticking away, the scoresheet was still blank. Then, George West scored from a seemingly offside position. St George’s protested strongly but the referee stuck to his decision and the goal stood. The game was continued until half-time but the demoralised Saints didn’t show up for the second half. The game had to be abandoned. The MFA took a firm stand and, in addition to handing the points to Floriana, they suspended St George’s from all competitions up to the end of the season. The incident that occurred in the match between Sliema Wanderers and Ħamrun Spartans was more serious. Played on January 16, 1921, this game highlighted all the deficiencies of the Maltese game during that period. A disputed penalty led to disgraceful scenes of violence. Biased decisions by the MFA led to the Wanderers being banned for the rest of the season. With Sliema and St George’s out of the race, Floriana went on to win the title comfortably.